Singapore is a hot and humid country. Air-conditioner is like a basic necessity for every Singaporean. Especially during the month of June to August, where Singapore is hit with the less rain months, the weather will be hot and humid; everyone will hide in an air-conditioned room or shopping malls. Regular maintenance of your air-conditioner is critical as you would not want your air-con to be down during a hot and humid day! With the aid of modern technology, you may find many skilled air-con technicians to do the maintenance of your air-cons. In all occasions, people are skeptical on the needs of maintaining their air-con units. In actual, air-con need maintenance and service every two months or maximum every quarterly depending on your area of living environment ie. Air-con in dusty environment need to be service and maintenance every month. Do not wait till the air-con having some problems then seek for a professional assistance. Regular air-con serving will help you greatly in cutting some unnecessary costs of air-conditioner maintenance. However, always find a reliable and professional air-con company to asssit you! Often if an air-con unit is not serviced properly, you may expect a water leakage occur. You will discover that your air-con unit is having difficulties in cooling the room and you will feel uncomfortable and wonder what is happening. Skilled air-con technicians are trained and will be able to advise you the necessary problems after inspecting. After the inspection, they will use their correct methods and tools to fix the problems. This in turns will help to keep your air-con functioning and have a longer life span. Lastly, if you decided to have your air-con to be service under a regular maintenance, do sign up a service maintenance contract with a reputable and trustworthy air-con serving company. Do ask the air-con servicing company to state down all it related cost and benefits towards the air-conditioner. 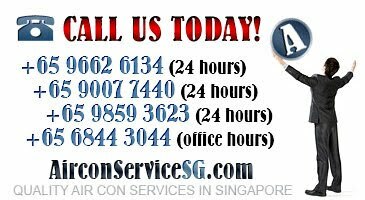 You may ask if there will be any promotions on air-con spare parts, replacements and chemical overhaul if the normal servicing cannot resolve your air-con problems. In addition, ask if there is any perks that you can take advantage of and do a comparison with other air-con serving companies. This step allows you to decide which company able to help you with their best service and promotions and thus fit in your budget and motives well. To conclude, with a regular serving of air-con will increase your air-con performance and its life span.